My goal in creating this pack was a basic introduction to the United States and some of its symbols. I projected the page onto the board, discussed the information and then had the students complete the instructions. We have used this pack as an introduction to President’s Day. 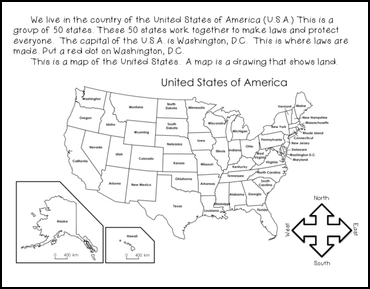 I have included a map of the U.S.A., the flag, the pledge, and more.